Q: Dear WholeFamily Counselor, I was reading your article, Making the Punishment Fit the Crime and it makes absolute sense. I have a situation however that I need help with, maybe you would have a suggestion? I have a five-year- rambunctious boy. He is very active, although he is not hyperactive or ADD. We refer to him as Dennis the Menace, because of the trouble he is constantly getting into. He does things that I would never imagine. How he thinks up this stuff really bothers me. Last night was the ultimate. I was talking to my mother on the phone in the Living Room and had been on the phone for about five or so minutes when I heard the smoke alarm going off. I immediately ran to his room and found him standing on the stairs screaming with a tea towel up in flames on the carpet. A Drama on Discipline. Tina (28) and Steve (28) are the parents of a six year old son, Josh. It's Saturday night and Tina is returning from a shopping trip to the mall. Tina: Hi Steve. (looks over to the couch). Josh, what are you doing up? Steve, what's he doing up? Steve: We were playing cowboy. We were having a great time. Tina: I assume you read him a story. Steve: Not yet. Tina: Josh, please go to bed. (She walks him to the bathroom and to the bedroom where she reads him a story.) Tina comes back down the stairs: Steve, I can't believe you. I came home at 9:00, and Josh is supposed to be in bed at 8:00. He's six years old. Children love to cooperate. They're great at playing, trusting, and learning. They want to feel close to their parents and loved ones. But every day, things happen that hurt children's feelings. They want more time for fun and intimacy, they get frustrated because there are things they can't do yet. There are many difficult moments for a child every day, no matter how hard we parents try to protect them. When children's feelings are hurt, they release those bad feelings immediately -- this is the healthiest response. Crying and tantrums, with plenty of trembling and perspiration, and eventually laughter are the natural way children heal from bad experiences. "If you don't give me that, I'm going to hit you!" my four-year-old said to her three-year-old brother. I was shocked! Why was threatening to hit her brother her first reaction? Why couldn't she at least try asking him nicely? When I thought about it, however, I realized that she was only imitating me and that threatening to smack was how I was keeping the kids in line lately. While I almost never actually gave my children a slap, I realized that lately I had been threatening to do so regularly. My parenting skills and the way that I was handling my anger, was affecting my children's approach to each other. If I didn't seem to have the tools to verbally resolve my conflicts, how would my children ever learn these tools? If I didn't seem to have the tools to verbally resolve my conflicts, how would my children ever learn these tools? It was then that I resolved to rely more on a different method of child discipline, one that had worked in the past with my oldest daughter: time-out. The idea of "time out" (as described in Time Out: What is it and how can you make it work for you?) goes against everything I believe in as a mother and as a therapist. In fact, the concept of "time out" exasperates me. It sounds more like a program designed for laboratory mice than one that is healthy for children and parents. Why am I so offended by Time Out? Because it denies context. The program described in that article doesn't mention that children behave in a context-that of the family-- and that they absorb its atmosphere. A child doesn't behave in a vacuum. He is a reflection of his environment, and especially of his parents. Everybody seems to be doing time out. Wherever I look I see articles about the pros and cons of the method and descriptions from parents of how it did or didn't work for them. But these descriptions are usually missing the next step: time in. I first saw the term "time in" used in The Discipline Book, by Dr. William Sears. He cautions parents that while time out is an appropriate method of disciplining children, no parent should forget what is equally important to their young child -- time in. What Is Time In? Time in is what should come before and after a time out. It's the time you spend encouraging your child's "good" behavior instead of just working on changing his "bad" behavior. Recently, I asked my five-year-old to get me something from upstairs. "Yes, your majesty," was his reply. The day before that, it was "Certainly, Miss Mommy". Last week? "Sir, yes, sir" and "Whatever you say, Lady." I can't decide whether this lack of respect upsets me or not. On one hand, he is being what my mother would have called "fresh." On the other hand, the atmosphere in the house is convivial and open. He talks to me, and tells me everything - things I'd have been afraid to tell my parents. I figure: I can deal with the insolence if it buys me honesty. Don't get me wrong; I am not one of these parents who will do anything to be popular with my kids. That is not my goal. Q Dear WholeFamily Counselor, I am a mother of three children, ages four-months, two- and three-years-old. Their father and I are having difficulty coming to an agreement on discipline for our two- and three year-old-daughters. I feel that you should remain calm, talk it out and if talking doesn't work then use time-outs, and if all else fails, they receive a spanking (w/o physical pain). Then I tell them "Mommy doesn't like to spank, but if you don't act like a good girl mommy has to help. I love you and need you to behave so we don't have to do this." I normally don't have to go past talking. Their father, on the other hand, tends to be less willing to talk it out. Q Dear WholeFamily Counselor, I would like to hear about the pros and cons of hitting children as a form of discipline, and when it becomes abuse. I only hit my four-year-old son in two situations: Either he just hit or attacked me physically (he's pretty strong), and I respond instinctively, or he is in the midst of a dangerous, violent act, and I prevent it by being physical. My brother-in-law voiced some concern to my wife (his sister) over this weekend, and I wanted to check with an expert about the theory of hitting, and get some feedback about my particular case. Thanks. A I'm glad you wrote in with this question, since this is an area of concern for many parents. Q Dear Dr. Sylvia, My husband and I have a four-year-old daughter and seven-year-old son. The challenge is with our four-year-old daughter. Just as background, we are a very happy "all-American" family. My husband is an incredible father. The problem we are having is that our four-year-old is what you may call a "Mama's girl." She will only accept Mommy doing things for her. This is not a phase since it has been going on for about a year. My husband is beside himself, and it is now beginning to hurt his feelings. If he goes to pick her up at school, she will not go with him. She begins crying and says, "I want Mommy to pick me up." Once they are in the car and she realizes she is not getting her way, she is nice to him. Dear WholeMom, My daughter is four. She will turn five in August. Lately she has become very short tempered. Our next door neighbor is already five. When she visits our home, my child loses control over not getting her way and automatically starts hitting, pushing and kicking. She also screams and loses control all around. Yet, in just a matter of moments she is calmed down and expects everything to be forgiven. I have approached the situation every way possible, talking to her about other people's feelings, about showing respect for other people's bodies, explaining that it is not acceptable behavior in anyone's eyes, telling her that people won't want to be her friend. Q: Dear Dr. Sylvia, My brother is raising his four-and-a-half year old son on his own. The boy sees his mother and sister every other weekend. My brother loves his son and is struggling with patience to deal with a child of this age. My parents do what they can to help. My nephew is in Head Start every day, and then, stays with my parents until his dad gets home from work. My brother's job is very frustrating, and many times when he gets home, he is not in the best frame of mind. It is hard for him to be "mom" and dad, but he tries really hard. My nephew is fine with my parents, but when his dad picks him up, he misbehaves. He loves his dad and is excited to see him. How many of us have children who are less well-behaved than we would like them to be? How many of us can set limits and keep them? How many of us find it easier to give in to the deafening screams of a two-year-old than to stick to our guns? Or to the teenager who wants to spend all her free time watching MTV or staying out till three a.m.? Countless observers of modern parenthood have said that today's parents are less strict, less firm, less sure of themselves as parents than their parents were. Some say it's due to the fact that parents today bend over backwards for their children because they feel guilty about not being able to give them the thing they most need: time. I write at length in this section about the Time-Out method. However, that method isn't appropriate in every situation. If the punishment is directly related to the child's behavior, a child will be more likely to remember the punishment the next time around. Making a child sit on her own in a chair once, twice, perhaps three times a day is more than enough time sitting alone. I don't know about your children, but mine seem to need intervention more than two or three times a day. Not only that; time-out does not work for all children or for all parents. So what should you do? Here's another good solution: Find the punishment that fits the crime. Dear WholeMom: My daughter is 1 1/2 years old. She doesn't listen to "Time out" anymore and if I tell her to go back to "Time out" she cries or hits. The worst part is I'm very emotional because I'm 3 months pregnant. So when she cries, I cry, and then I feel like a mean mom. I really don't know how to handle this and I don't believe in hitting a child, not even a light tap. What should I do? - Emotional Mom Dear Emotional Mom: There are a number of issues to address here. The first one is your personal state of mind that is, by your own admission, "very emotional" since you are three months pregnant. The second issue is your daughter's behavior. You have heard your friends talking about it, you've seen some articles in parenting magazines and know it's supposed to be "the thing to do" but you are just not sure how it is supposed to work. Or you've been trying to do it, but it's just not working for you. Here is a step by step program for setting up a time-out program and more importantly "getting it to work." Why "time-out"? Although the times and family make-up have changed dramatically, the foundational principles of intelligent parenting survive. Research has provided clear fundamentals that direct children toward confidence, security, and achievement. Furthermore, there are a fair number of day-to-day options available in raising children from which parents can choose. The children of this millennium will continue to be influenced by much more than their families; however, parents and grandparents continue to set the important foundations. I anticipate with enthusiasm sharing with my audience the cornerstones of raising happy, achieving children based on my many years of clinical work and my research with families. Jenny has it right when she says she thinks kids need structure, chores and rules. She recognizes that she has trouble following through. That's one step in the right direction. Jenny tends to request something of the kids and then immediately begins compromising and modifying her position. She needs to think through ahead of time where she is likely to end up. If she is going to end up by caving in completely, she might as well not get herself all worked up and do whatever needs to be done herself. If, however, the issue is a rule, she might consider the following guidelines to help her choose her rules and make them stick. 1. Jenny doesn't see herself as a grown up. When dealing with her kids, she easily regresses to being one of them. She says things like, "Aw, come on..." and "I don't care." Children deeply resent a parent who is afraid to parent. Being an adult is a scary thing. It means taking responsibility for our lives and our actions. Jenny may have grown up with parents who did everything for her or she may have grown up feeling discounted rather than supported and secure. She has little self-confidence and looks outside herself for reassurance. Jenny is not in touch with her own inner authority. She's not able to look her kids straight in the eye and say, "Turn off the computer and come to the table. Dear Dr. Sylvia, I believe our five-year-old daughter has the empowerment problem you spoke of in your article. (See Foundational Principles Parenting) Now that we've realized the problem, how do we fix it so she doesn't continue to act like a spoiled brat? We set what we believe are the appropriate limits. However, she pushes and pushes us to the point that we have to send her to her room or ground her from her favorite channel on TV. She honestly believes that she's THE BOSS. Any suggestions? A You will have to set clear limits for your five-year-old, but you'll want to be careful not to get on a negative track of constant punishment, or you'll soon find your daughter becoming sad or angry. Dear Dr. Sylvia, I have a five-year-old daughter who just started kindergarten this year. Her behavior lately has been way out of line. She had a problem in preschool with respecting authority, and it has now carried over into kindergarten. We have had a problem with it at home as well. She talks back to adults, and she yells. When we tell her that she will have privileges taken away if she doesn't do what she's been asked to do, she says she wants her privileges taken away. Whenever she does something for her dad or me, or if I've asked her to do something for her baby sister (one year old,) she always asks what she will get in return. It seems to always take many times to get her to do something, and then it's a battle. Dear Dr. Sylvia, I am concerned about my three-year-old nephew. My sister has been having ongoing problems with his behavior, which is very defiant and even violent at times. He will pick fights with other kids or do things on purpose to hurt them or make them cry. He will also hit my sister, or occasionally, other adults like myself. He also swears a lot, using strong words that even sound bad coming from an adult. My sister has tried time-outs, but he will not stay in place. He can be such a sweet, lovable boy, but then, all of a sudden, his mood switches and he becomes mean. Do you have any suggestions for my sister to help her help him express his anger in a more positive way, or for redirecting his negative behavior? I should say that he lives in a household with a father that is quite angry as well. It's Sunday morning. Pam, a 31-year-old mother, is getting ready to go to a party with her four-year-old daughter, Cara. Mother: We gotta hurry. Grandma said that we should be there early so she can take pictures of us. Cara: Okay. Cara stays on the floor playing. Mother: Let's get you ready. Cara: Why? Mother: I told you. We're going to Grandma's. She's having a birthday party. Cara: Is it my birthday? Mother: No, it's Grandma's. Listen it's time to stop playing. It's time to get ready. Cara doesn't look up. Mother: It's time to get dressed. Here are your clothes. I'll give you a few minutes and then we'll get you dressed. Well, I don't know about you, but this is a scene that I find very familiar. Mom wants one thing, four-year-old wants something else and it ends up in a big tantrum! Trying to reason with a four-year-old, even when you happen to be objectively right, is never an easy job. In this drama, the mother's feelings are understandable; she wants her daughter to look nice for a special family occasion. She is a caring mother who is clearly trying to do the right thing. WHERE DOES SHE GO WRONG? She goes wrong, in my opinion, by giving her daughter only one option -- this one dress or nothing. Dear Dr. Sylvia, I have an eight-year-old daughter, who does not like to listen. Her teacher says she talks too much in class, and I have taken away some of the things she likes to do, but she still talks in class. It started in first grade and continues. I have read many books about discipline and have not found the answer. She is usually a sweet child, but sometimes she really gets out of hand and throws tantrums like a two-year-old. Dear WholeMom, My twelve-year-old daughter has been hanging out with a group of kids lately who I am not crazy about. The girls dress in very slutty clothes and they go to movies that are not appropriate for kids their age. When I question my daughter about where she is going she gets defensive and says, "Everyone does it. They come from good families so if their parents let them go, it must be okay." It's true they come from good families but our values are somewhat more strict. What should I do? Old-Fashioned Mom (Am I?) in New York Dear "Old-Fashioned," There is nothing old-fashioned about a parent setting guidelines for her child's behavior, whether it be dress, entertainment or anything else. I am so glad I found this web site. I am in a terrible situation. My husband is a "loud," yelling person. He thinks that this kind of discipline works. It just makes things worse in our home. We have two children. Our son is 12 and our daughter is 11. The yelling has been going on for years and now our children yell, especially our son. There is so much anger in the home. I am looking into family therapy for my children and myself. My spouse will not go. I have spoken to my husband numerous times before about this problem. He will stop the yelling for a few weeks and then it comes back. What should I do? A Thanks for your important question. It appears to me that you are on the right track. Dear WholeMom: I am struggling with my nine year old son. For the past two years he has become increasingly rude and even yells at me. He doesn't seem to realize that he is yelling or being rude. Anything I say to him gets a negative response with an inappropriate tone. I am finding it very hard to come up with positive things about him. He was an only child for seven years and now has a two year old sister. He said to me once, "Why do you only like us when we are babies?" It is hard because my two year old is so good and my nine year old seems to thrive on negative attention. I am trying to be more positive, but he pushes all my buttons. He enjoys teaching his sister things I don't want her to do or say (for example: She says "Mommy's a jerk"). Q: We got cable television a month ago and my two teenage daughters seem addicted to MTV. I see their behavior deteriorating. They have no motivation to do anything else and they seem more tense. Is the extra television watching the cause of this? A: Guest Expert, Anat First, PhD, answers: Unfortunately, I can't give a clear-cut answer to your question. Researchers are divided on this issue. Some claim that television is the most important factor in our media culture; that many of our images and much of what we learn and know comes from our media environment. They say that television has a great influence on those who watch it. Others say there is no influence from above, as it were; that everything depends on what the consumer does with what he sees or hears. It makes me so sad that our 15-year-old son shows no respect for either his mother or me. In fact, he laughs off any person of responsibility - teachers, coaches, etc. It is very confusing for me as we have always given him the material and moral support he has demanded. Yet he doesn't seem to appreciate this at all. His impudence is so extreme that he even mocks us in front of our friends. We have tried to explain to him that his behavior is unreasonable but he laughs us off, telling us that we're old and don't know anything. How do we deal with him? A I believe that your indulgence towards your son is the direct cause of his arrogant disrespect. Dear WholeFamily Counselor, Hi. I have a 16-year-old that is very resentful and never wants to do anything or go anywhere with me. I've tried forcing her to go to counseling and she refuses to go. She is okay at times but when I ask her to do chores around the house she mumbles under her breath and then proceeds to do whatever I asked her to do. She wakes up in the morning with the nastiest attitude. Many times I just want her to just go live with her father so that she can see how good I really am to her. I pray that someday she will be a happier person. 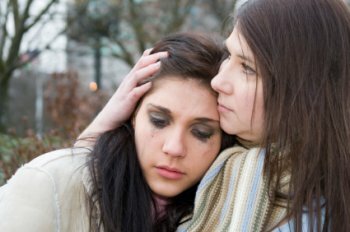 A You are going through what millions of parents of teenagers go through every day. Dear WholeMom, I feel it's never too late to train my biological kids to pick up, although I have always taught them to pick up after themselves since they've been little. They usually do what I say. When my 16-year-old non-custodial son stays with me over the weekend, he always cleans his room before he leaves without my asking. My stepson is a different matter. He must have always been very sloppy and gets away with it, especially at his mother's house. When he comes to stay with us, he brings his sloppy habits with him and when I or his dad ask him to clean up, he usually does not do it. His room is a disaster area. (Even his mom commented on the mess!) I am at a loss over what to do! I feel as if there are two different standards for my two children and my stepson. I've held a lot of challenging jobs in my life including farmer, teacher, soldier, police reporter and waitress. But the difficulties of all those jobs combined don't hold a candle to the constant, daily challenge of being a parent. I wanted to have kids for as long as I can remember. I baby-sat and took care of young nieces and nephews from an early age. I loved my jobs as camp counselor and youth group leader. So I thought I knew what children were all about. And maybe I did. But being a mother threw me for a loop. Babyhood was a breeze. Somehow, I knew just what to do and I loved doing it. I was once bullied by a jerk who wanted to show off in front of his friends . He took a chair from me during school when I was sitting down and I fell on the floor. I said to my friends, "That guy's an idiot" and he heard me. He started to hit and kick me and then walked away. I didn't hit him back because he was bigger and older than me. The book Taking the Bully by the Horns explains why bullies bully.